Is the Conservative lead 21 points or 9 points? Two polls for tomorrow’s Sunday papers give wildly different pictures of the state of public opinion. Opinium’s poll for the Observer shows the gap between the two main parties dropping into single digits for the first time in more than two months, while the ComRes poll for the Independent and Sunday Mirror has in increasing to 21 points, the biggest lead for a Tory government since September 1987, according to Mark Pack’s PollBase. Both were done online between Tuesday and Thursday. So why are they so different? Well part of it is that these two polls are usually a bit different. 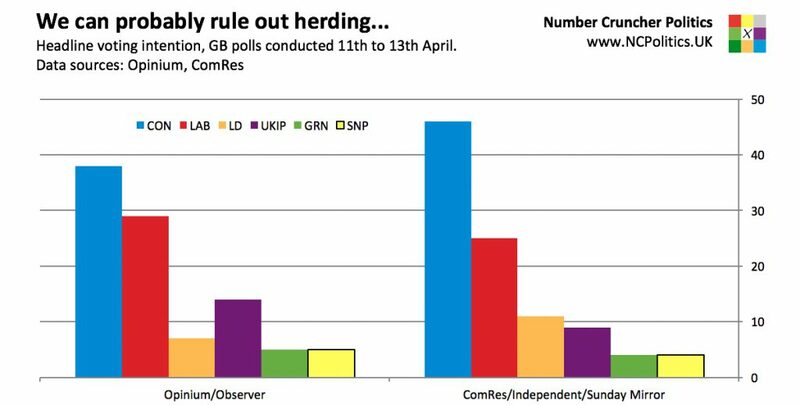 Last month ComRes had CON+17 while Opinium had CON+13, and in February ComRes has CON+15 while Opinium had two polls that averaged CON+10. That’s because their methodologies are different. ComRes balances its samples politically using past-vote weighting to the 2015 result, whereas Opinium uses a model based on what it calls party propensity. ComRes assigns each respondent a probability of voting based on demographics combined with how likely they say they are to vote, while Opinium uses a hard cutoff, taking into account only those saying they’re 10/10 certain to vote. And their raw samples probably differ too. There is no single right way to do this, but different approaches can get different results. But why are they so different this month? Most of the 12-point gap is down to ComRes showing the Conservatives increasing their advantage by 4 points and Opinium showing Labour reducing their deficit by the same amount. This sort of divergence is too much to be explained solely by random noise (though that may well be part of it) but there may be some non-random noise as well. There have been instances in the past of polling at certain times of the year producing quirky results. That tended to be a particular problem for phone polls but it can affect internet samples too. The fact that fieldwork was done during school holidays and in the run up to a long weekend may mean that not everyone is as likely as usual to open a pollster’s email, and crucially, those that are can be different to those that aren’t. And of course it can affect different polls differently. Opinium’s sample is definitely more Labour this month than last month – the recalled 2015 votes for the main parties (excluding non-voters) are 33-33. Last month they were 36-31 in the Tories’ favour, much closer to the actually mainland result of 37.8 to 31.2. The move with the ComRes poll is harder to explain. It seems reasonably consistent across geographic, demographic and 2015 vote. That doesn’t mean that it definitely isn’t a rogue, but there red flags that we sometimes get don’t seem to be in evidence on this occasion. In any case, while the wedge between these two polls looks dramatic, bear in mind (1) that they they were done at a very difficult time to do polling and (2) they usually get quite different results anyway.